Portable SSDs are becoming more and more popular since the quality of videos/images are getting better and take up higher amount of storage space. Upgrading the internal storage of a typical work station, for e.g, a Mac, can cost nearly double when compared to portable SSDs. 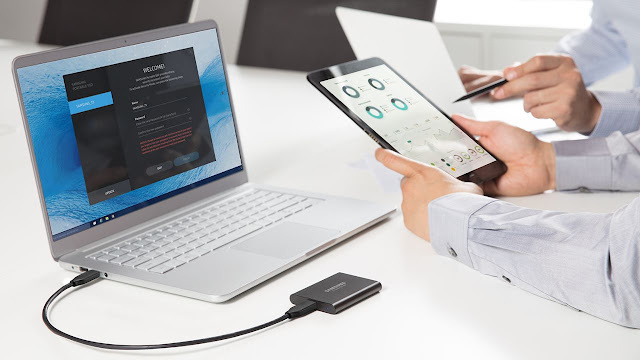 Samsung's T series of portable SSDs are among the best in class, and now the company has come up with the T5 SSD. 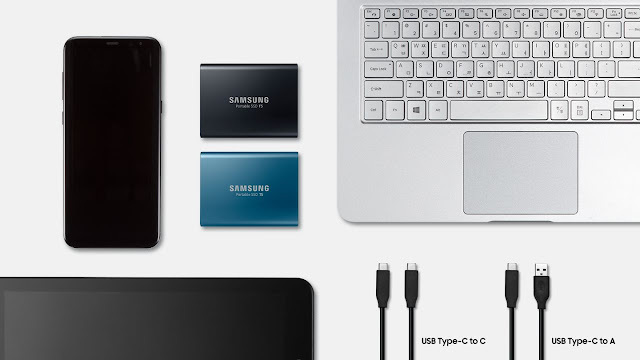 Samsung Electronics has launched their latest portable SSD, the T5, in India. Featuring 64-layer V-NAND technology enables the T5 to deliver high speeds with encrypted data security in a compact and durable design. “At Samsung, we work towards delivering meaningful innovations and the Portable SSD T5 continues our legacy of leadership and innovation. We are confident that the T5 will exceed consumers’ expectations for external storage by offering 4.9 times faster speeds than external HDD products and a solid metal design that is lightweight and conveniently pocket-sized. T5 is surely a stunning proposition for Power Users like Media Professionals, Technology Enthusiasts, Content Creators and Business Professionals,” said Mr. Sukesh Jain, Vice President, IT & Mobile Enterprise Business, Samsung India. The T5, aimed at content creators and professionals, measures just 74 x 57.3 x 10.5 mm and weighs just 51 grams. This incredibly small structure enables portability and ease of use for the user. With an exterior built out of metal and no moving internal parts, this SSD can withstand drops up to 2 meters. The T5 supports maximum read speeds up to 540 MB/s, with ability to work seamlessly over multiple OSs and devices. A mobile app for Android smartphones and tablets also adds to the convenience of the users. The connectivity is enhanced with the use of the latest USB Type-C port. A USB Type-C to Type-C cable and a Type-C to Type-A cable are also included in the box. An optional AES encrypted password protection is available for secure file transfers. This device will come with a standard 3 year warranty. Comparing it to the previous generation portable SSD, the T3, there are a few minor changes. The T3 has a metal-plastic combo design while the T5's exterior is entirely made of metal. The overall design hasn't changed much, with the size and shape remaining pretty much the same. T5 has chamfered edges which give it a slightly premium look. The read write speeds are slightly higher due to the V-NAND flash technology and faster second generation USB Type-C port. Pricing of T5 starts from . There are two color options available, Deep Black and Alluring Blue. Alluring Blue will be available only for 250 GB and 500 GB variants while Deep Black will have either 1 TB or 2 TB storage capacity. The exact pricing of each model is as follows: 250 GB - Rs. 13,500; 500 GB - Rs. 21,000; 1 TB - Rs. 40,000; 2 TB - Rs. 80,000. These will be avilable at all major retail outlets throughout the country.